These charts show the results of the new Economist / YouGov Poll -- done between July 29th and 31st of a nationwide sample of 1,500 adults, with a 2.8 point margin of error. 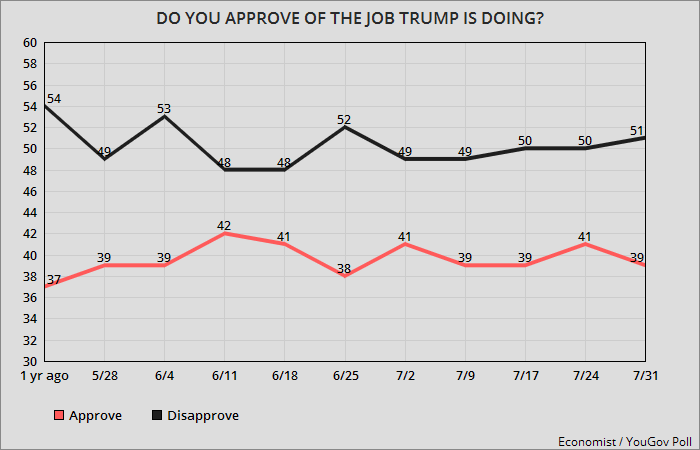 Trump is still upside down when it comes to job approval (39% approve and 51% disapprove) -- a negative gap of 12 points. And the stability of those numbers is remarkable. There has been no movement outside of the margin of error for quite a while now. I did something a bit different with the bottom chart. I eliminated those who only somewhat approve or disapprove, leaving only those who strongly approve or disapprove. These are the people most likely to vote. Those numbers are even worse for Trump. 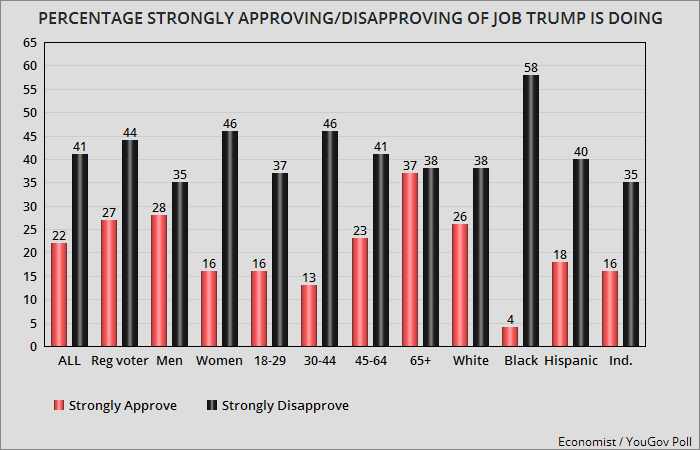 Only 22% strongly approve of the job he is doing, while 41% strongly disapprove -- a negative gap of 19 points. Trump has no coattails for Republicans in competitive races to cling to -- and that's an understatement.